Credits to selmab. I do not own this image. Taken from a website which pictures are free to use. Warning: This Epic Battle hits back, so before you initiate this epic battle be prepared! This epic battle will only hit the Active in Epic Battle members. For 10 years, 250,000 kingdoms have attempted to conquer this 10,000 foot steel beast, known as “The Castle”. It is the world’s most difficult epic battle, testing the limits of any kingdom that dares to try it. No one has been to realize the dream of victory. Since creation, the castle has exacted a terrible battle. The golds spent, the spells casted and armies sent to battle have all gone down to nothing and despite heroic efforts, all who have attempted it came up painfully short. Now, the giant, well-fortified castle still looms. Although far from your kingdom, it is still on the realm of Kingdoms At War. 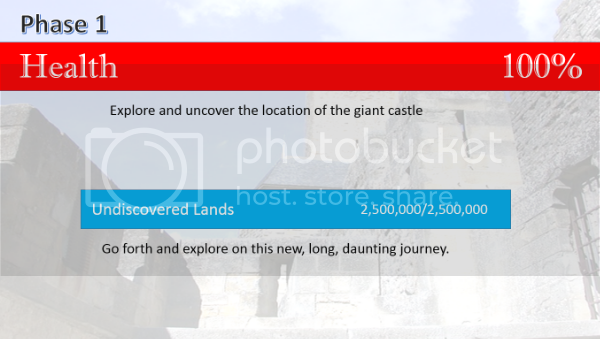 Will you be able to finally do the impossible and destroy this castle, where no one has ever done it in history? Last edited by sean893 on Mar 6 2015, 4:13pm, edited 3 times in total. First: Scout Undiscovered Lands to zero. Notice: Phase 1 will be immediately completed AFTER the Undiscovered Lands reaches 0, and therefore Phase 2 will trigger immediately. Phase 1/7 Completion: Your forces meet a small group of enemy patrol units, accompanied with soldiers. Defeat them and continue exploring! Second: Scouts Undiscovered Lands to zero. You were attacked by Enemy Soldiers and lost! They took 17,615,845 gold from you! Typically, an incoming hit will get 0.5% to 1% of your soldiers killed (if you win the defence) or 3% to 5% (if you lose the defence) The enemy soldiers cannot give you any more incoming hits once they reach zero. Phase 2/7 Completion: It is now sunset, and your forces are tired of the long march. Find a suitable place to build camping tents and rest. First: Use Item Camping Tent on Armies’s Tents until full. Credits to OpenClips. I do not own this image. It mostly depends on your strength. The stronger you are, the faster you can build the tents. This figure +213 is done based on MY current cs as of 7/3/15! WARNING: After the Armies’s Tents bar has been filled completely, your soldiers will now go to sleep in their tents. In the same time, enemy soldiers are waiting to kill them in their sleep! WARNING: You must NOT let the Camping Soldier’s Life go to zero. Protect them from the Enemy Soldiers for 1 hour. 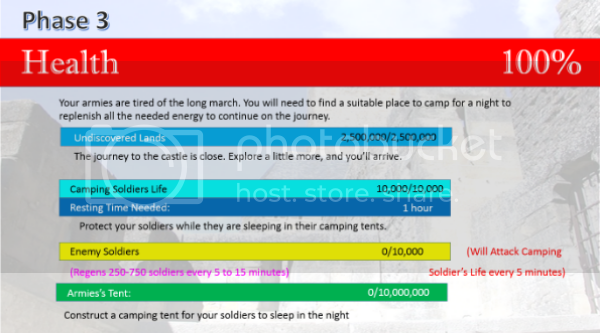 If the Camping Soldier’s life reaches zero before the 1-hour time is up, you will fail this epic battle immediately! Third: Scout Undiscovered Lands to zero. 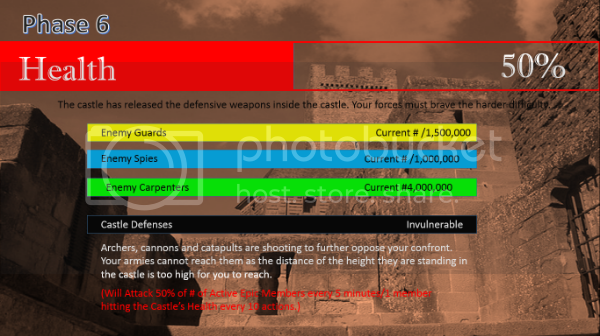 Fourth: Attack & Assassinate Castle’s Health to 99%. Phase 3/7 Completion: Your forces have finally arrived to The Castle. The fateful battle now begins! Last edited by sean893 on Mar 6 2015, 8:25pm, edited 1 time in total. Second: Attack & Assassinate The Castle to 80%. 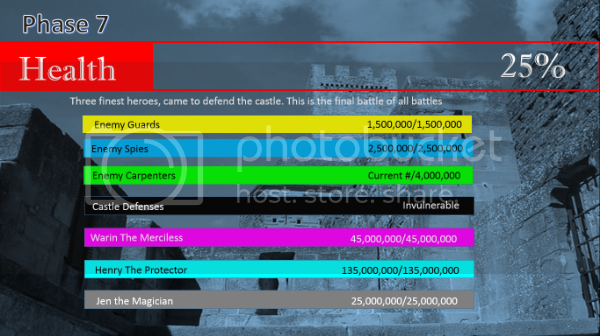 Phase 4/7 Completion: The enemy spies and carpenters have arrived to defend the castle! (Will repair the Castle’s Health, +1 HP per carpenter alive every 5 minutes. Fourth: Attack & Assassinate The Castle to 50%. 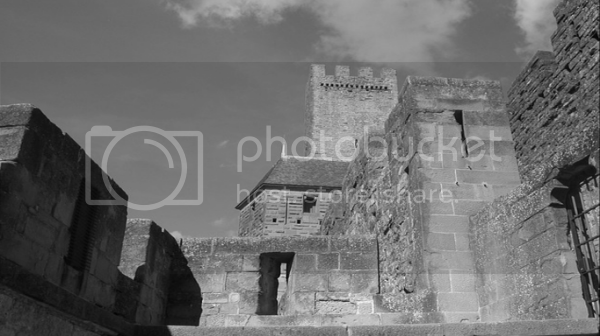 Phase 5/7 Completion: The enemy defences of The Castle is now armed and ready to further oppose your assault! A short note: The Current # means that the number of Guards/spies that is currently alive will still remain the same. It will not fully regenerate. For example, when it’s Phase 5/7, and the # of Enemy Spies is (42,700/1,000,000), when Phase 6 is triggered the Enemy Spies will remain from 42,700. Fourth: Attack & Assassinate The Castle to 25%. WARNING: CASTLE DEFENSES: Archers, cannons and catapults are shooting from high above to further oppose your confront. Your armies cannot reach them to the distance of the height they are currently standing in, as it is too high to reach. 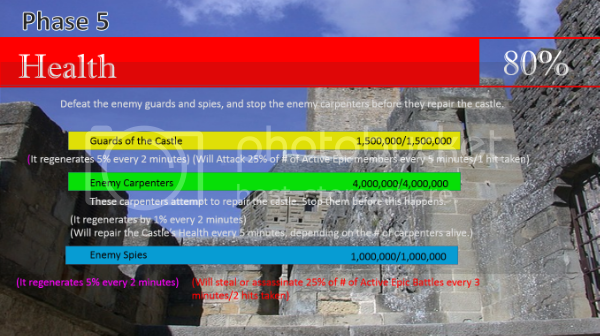 The Castle Defenses will attack 50% of # of Active Epic Members every 5 minutes/Attacking Member per 10 hits done against The Castle. 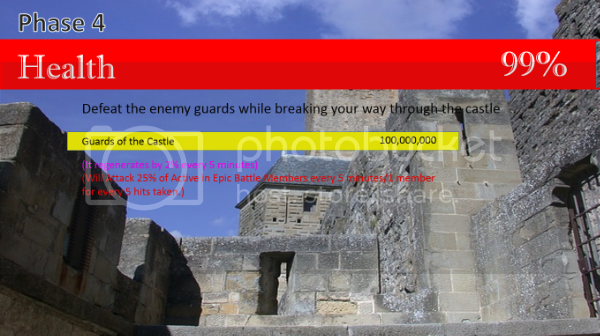 Typically, the Castle Defenses’s attacks kills 1-5% of your soldiers, depending on your defense stat. There is no win or lose on this one. Phase 6/7 Completion: Three bravest and finest heroes have arrived to defend the castle. The enemy spies and Guards of the Castle has also fully revived. This is the last stand, and is now the final battle of all battles! NEW OBSTACLES: Warin the Merciless(45,000,000 HP), Henry The Protecter (135,000,000 HP), Jen The Magician (25,000,000 HP). Obstacles that will still exist: Enemy Guards (fully revived), Enemy Spies (Fully revived, and with 2,500,000 HP. ), Enemy Carpenters (Will remain the same), and Castle Defenses (Invulnerable). First(Optional): Use Item Orb Of Illumination at Jen The Magician to zero. Second(Optional): Attack & Assassinate Henry The Protector to zero. Attacking with the Item Summon Undead does 5x DAMAGE. Seventh: Attack & Assassinate The Castle to zero. Additional Info about the Warin, Henry and Jen can be found on the Extra Information(IMPORTANT). WARNING: The Castle Defenses has changed their type of weapon to throw at you. This time, it will be a Meteor Death Bomb. Every 1 hour, the Meteor Death Bomb will be thrown and it will hit ALL Active in Epic Battle Members’s (whose last action was made less than 2 hours ago) 75% of their current # of soldiers. (e.g. if you have 5,000 soldiers and you get an incoming notification getting hit by a Meteor Death Bomb, you will lose 3,750 soldiers. Similarly, if you have 100% soldiers you will lose 75% at one incoming notification, resulting in 25% soldiers left. Mission Completion: The finest heroes staggers and falls along with the carpenters, spies, guards and the defences, and The Castle has been successfully destroyed! Your forces stand victorious! Last edited by sean893 on Oct 13 2016, 8:53pm, edited 1 time in total. 1,000 Camping Tents will be automatically given to each player who joins the epic battle (upon 1st action.) It will be on the Others category on Items. From Phase 2 onwards, you will begin to receive incoming hits! From Phase 4 onwards until Phase 7, you can get to choose on which target you want to attack. Double-click the bar you want to choose as your attack target. You do not need to first attack the side bars. You can even choose to attack the Castle even if all side bars are full! Should this Epic Battle finally gets defeated, it is suggested that it will not exist again for 2-3 months before reappearing. 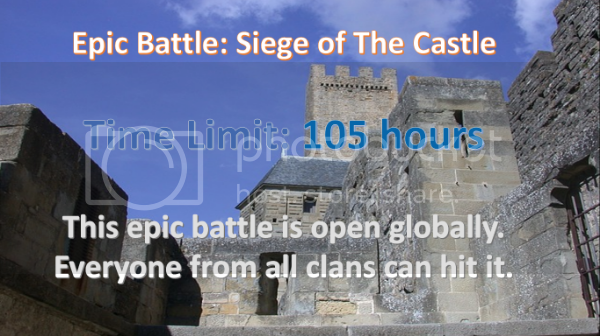 Another suggestion has been thought of, that if the players want to participate in this Global Epic Battle, they should cast an opt-in spell, to opt-in for the eb. But this has yet to be confirmed. Jen is a dark magician, the first of the three heroes. Dressed in her black magical suit while holding her finest wand, she is able to cast various spells such as healing her allies, poisoning her enemies. With the most notable spell on her hand, the Dark Magic Absorption, any hits she take will increase her life instead of damaging her life. 1: Poison Gas= Poisons 25% of # of Active Epic Battle Members, stopping their spies and soldiers from regenerating for 20 minutes. 2: Heal= Casting this spell can heal 1% of any allies selected. (e.g.) If Jen heals Henry the Protecter, he will be restored 1,350,000 HP. Henry is the second of the three heroes. Wearing the most and hardest steel of his armours, from head to toe, it makes him an important role as the defender of the castle. With this hero, most attacks will almost do no damage to him. 1= Attack 5 random Epic Battle Members every 5 seconds. 2= Attack a member in return for every 10th action done against him. 3= Attack the member who does 2 actions against The Castle. Typically, Henry’s attack kills 7-15% of a member’s Soldiers OR 4-8% of a member’s Spies depending on the Member’s defense/spy defense stat. Warin is the third of the three heroes. Riding on his horse and carrying a very heavy mace filled with spikes, it makes him the merciless as he conquers and attacks, destroying every single soldier in his path in mostly one hit. 1= Attack 20 random epic battle members every 5 seconds. 2= Attack the member who attacks him every 5th action done against him. Typically, Warin’s attack kills 9-35% of a member’s Soldiers OR 6-20% of a member’s Spies depending on the Member’s defense/spy defense stat. Since she is only hittable by items, there will be no combined stats for this hero involved. Fixed until Phase 7, where the Meteor Death Bomb is triggered. 1: Gold based on contributions. 3: A chance to drop Horn Of Calydor (Chances will increase by 5% for every 1,000 actions done, and 4,000 actions done will guarantee a 100% horn drop for a particular hitter. Nobility Points (1-2), mostly depends on luck, but more actions will help increase the chance to get Nobility Points! Health Crystals (1-2), mostly depends on luck, but more actions will help increase the chance to get Health Crystals. 1 Cloth/Steel of the Conquerer/Monarch/Defender to ALL members doing 1,000+ actions. 1-15 of any 4 single fragments of any event items dropped. (like the 4 fragment items needed to create Tribute Jewel), should any side events happen underway. 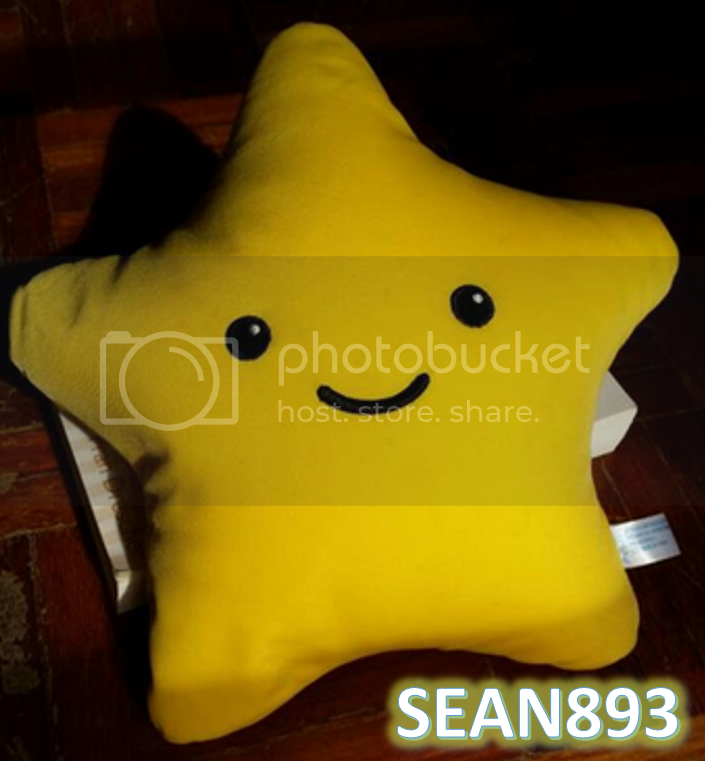 Last edited by sean893 on Aug 5 2015, 4:20pm, edited 9 times in total. MissingName wrote: How much would someone make off of hitting the eh? kenpachi-the-strength-man wrote: Sean nice post btw dtw i.e if u r below 20% will they still be able to hit u ? 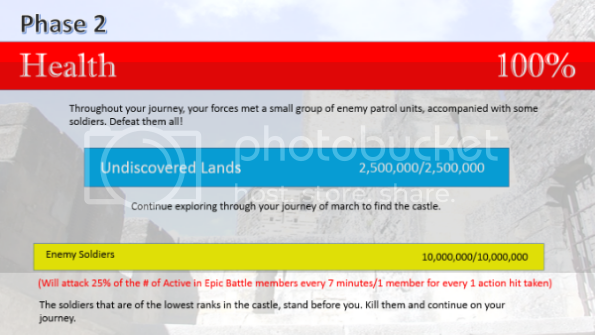 Once you're below 20% Soldiers and Spies, you won't be able to receive any incomings EXCEPT for the Castle Defenses in Phase 7, where the Meteor Death Bomb is triggered every hour to hit ALL members who made last actions up to 2 hours ago. If you made your last action less than 2 hours ago, even if you're DTW you will still receive that hit! Last edited by sean893 on Mar 6 2015, 8:34pm, edited 2 times in total.